Thrombophilia is a clotting condition that causes formation of excessive blood clots. Blood clots can form anywhere in the blood stream, but commonly form on the deep veins of the legs (deep vein thrombosis) or the lungs (pulmonary embolism). Thrombophilia can be genetically inherited from parents or acquired after birth with no known genetic component. Excessive or unexplained formation of blood clots is the most common symptom of thrombophilia. Symptoms associated with blood clot formation depend on the area where the clot has formed. Deep Vein Thrombosis: Localized redness, swelling and pain. The blood clot can travel to the lungs, heart or brain. Pulmonary Embolism: Difficulty breathing, fatigue, dizziness and sharp chest pains. Blood clots typically form elsewhere in the body and travel to the lungs. Brain: Blood clots can travel to the brain where blood flow is restricted or halted. Stroke can occur. Heart: Blood clots can travel to the heart causing restricted blood flow or blockage. Heart attack can occur. Complications of thrombophilia depend on the clotting condition and/or location of the blood clot. Localized complications, like redness and swelling are typically associated with deep vein thrombosis. If blood clots travel to other parts of the body like the lungs, heart, brain or other organs, blood flow can be restricted or stopped, causing life-threatening complications or sudden death. 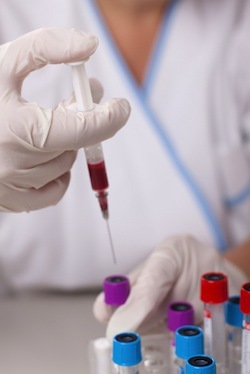 Most forms of thrombophilia can be diagnosed with blood tests, including a clotting screen. If a blood clot is suspected, ultrasound, fibrogen leg scanning or a venogram may be used to verify the presence of a clot. Thrombophilia is treated with blood thinners. Oral blood thinners include Warfarin or Coumadin. Other commonly used medications include aspirin, heparin and low molecular weight heparins, as needed. Certain blood thinners (Warfarin and Coumadin) are not safe for use by pregnant women. Heparin or low molecular weight heparins are commonly used to treat thrombophilia during pregnancy. Blood thinners may increase bleeding after surgery or vaginal birth, but overall pregnancy risk is low. It is especially important to notify your doctor of the pregnancy immediately as fetal side effects can occur within the first 13 weeks of pregnancy. With effective medical treatment, life expectancy is not altered in most thrombophilia cases. However, if the condition is acquired (not genetic), and a blood clot travels to the heart, brain or lungs, death can occur without proper treatment.